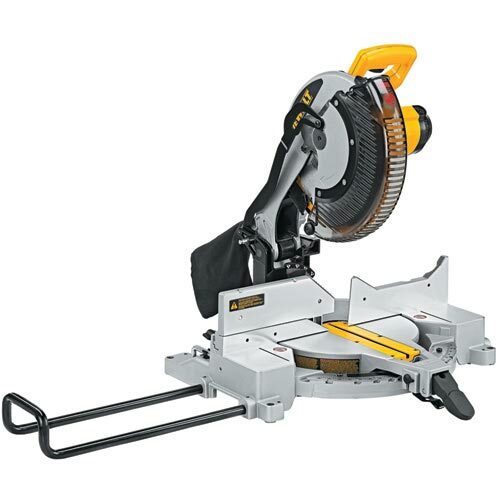 Compound miter saws are perfect power tools to add to any DIY renovator or professional contractor’s collection. They are highly practical and in the case of the Dewalt DW715 you can make the best cuts and get the best angles to help make them. Quality : Made entirely of stainless steel and packing several useful and specialized components and features, the Dewalt DW715 redefines quality among power tools. The machine has several smart features and performs incredibly accurate cuts. Usability : Setting it up on sawhorses for exterior rim projects is a simple affair. It is also quite lightweight and portable. Going up ladders or coming down them, working with interior trim installations, and doing post-framing exterior cornice work, etc. are made simpler. Performance : a 15-amp motor going at 4000 rpm is proof of performance and project capability. You can do so much with a machine like this. Both the miter system and a machined base fence support make cutting accuracy keener. Robustness : In addition to being made of stainless steel, the DW715 has a strong base that holds steady during projects. Even when carrying the saw between locations you will find its centre of gravity makes lifting easy. This is also how it will not tilt over and become a safety hazard. Thanks to the tall sliding fence feature, 5-1/4-inch nested materials can be crown moulded. In addition, 6-1/2-inch base moulding can be performed vertically against the fence. You can indeed cut it at 45 degrees to make a metered corner. Convenient sliding features make bevel cutting that much easier. A 4000-rpm power output from a 15-amp motor means extended usability and keen functionality. The miter detent plate is made of stainless steel, has 11 positive stops and maximizes accurate cutting and task productivity. There is increased bevel capacity: 0-3 degrees to the right and 0-48 degrees to the left. When it comes to miter capacity, you have 0-50 degree options for both left and right. The device can indeed perform straight cuts on a 2×4; as long as the blade is 90 degrees to the bed. While the device works like a charm right from the moment it is assembled, some transit circumstances might have caused a shift in the 90-degree angle. Crisp instructions are available with the product to help set these things right. The general purpose blade has 32 teeth and makes for a useful component. 4×4 cuts are a cinch. If you can turn the wood after the first cut, you might even be able to go 6×6. From homeowners to professionals, this power tool has left a positive mark and made things simpler. Professionals who know what they are doing found it easy to assemble and go. Newbie or casual hobbyists even DIY fans found the instructions more than adequate. For a power tool that packs all these features, it weighs only 42 pounds. Not only is this incredibly lightweight it also makes the DW715 quite portable. As detailed earlier, its general, bevel, and miter cuts are flexible and accurate. The machine has excellent centre of balance. Miter adjustments are foolproof. There is no room for detents to shift and the override makes angle adjustments easy. The dust bag collects only a little more than half the sawdust produced in one work session. This means regular emptying of the bag or an excess of sawdust when you cannot stop work but need to complete an entire session in one go. Unlike its predecessor (Type 2), the DW715 (Type 3; the onlymodel shipped by Amazon) does not support visual indicators, meaning no laser to help provide a visual means to accurate cutting. Along with such superb flexibility, the DW715 has an ace blade guard that moves up and stays out of the way as you lower the arm for cutting work. Its position enhances safety. An interlocking trigger keeps the saw from accidentally starting up. The guard goes down only when you lift the arm. Capable of cutting two different angles with just one swipe of the blade (this process is also called bevelling), you can angle this amazing saw’s blade head region to achieve such dual excellence. This makes the machine perform bevelling as well as metering. Anyone who wants a simple yet powerful saw to help with building projects or save costs with a construction business and own their own power tools instead of renting them must have the Dewalt DW715 on their shelves. Outstanding functionality despite the fact that it has no laser system, the DW715 brings speed, efficiency and dual angle cutting capability to all your projects. This means it performs at both the bevel and miter stage. It is light (42 pounds), safe (blade guard and lock triggers), durable, and sturdy (stainless steel).